Day two of my solo trip from Cincinnati, Ohio to Seattle, Washington. There is a lot of corn along I-29 through northwest Missouri, western Iowa and southeastern South Dakota, and then along I-90 west of Sioux Falls to the Missouri River. I mean a lot! And it goes for as far as the eye can see. I think it made it to “knee high by the fourth of July”, as the saying goes, so the farmers ought to be happy. I left my daughter’s house in Olathe, Kansas a little later than I expected but that’s okay, we had a good visit. There’s not much to look at except rolling hills and corn, corn and more corn across Iowa. I had to give the music CDs and the book on tape I brought with me a break so I turned them off and tuned into my own thoughts. I reflected back on my post from the day before, specifically my comment about being able to throw my trash in the back seat without anyone telling me not to. That reminded me of something author Matthew Kelly says in his book The Seven Pillars of Catholic Spirituality. He uses that as an analogy for our daily sins. We sin a little here and a little there, and we let them slowly build up until we have a heap of them. Kind of like the rolled up fast food bags piled up on the floor board of the back seat. It’s been a month or more since I went to reconciliation and I started thinking about how the trash in my personal back seat was starting to pile up. I had to stop for gas in Sioux City, Iowa so I logged onto masstimes.org again to see if there were any churches in Sioux Falls, South Dakota that I might be able to find that had reconciliation scheduled for about the time I would be passing through there. 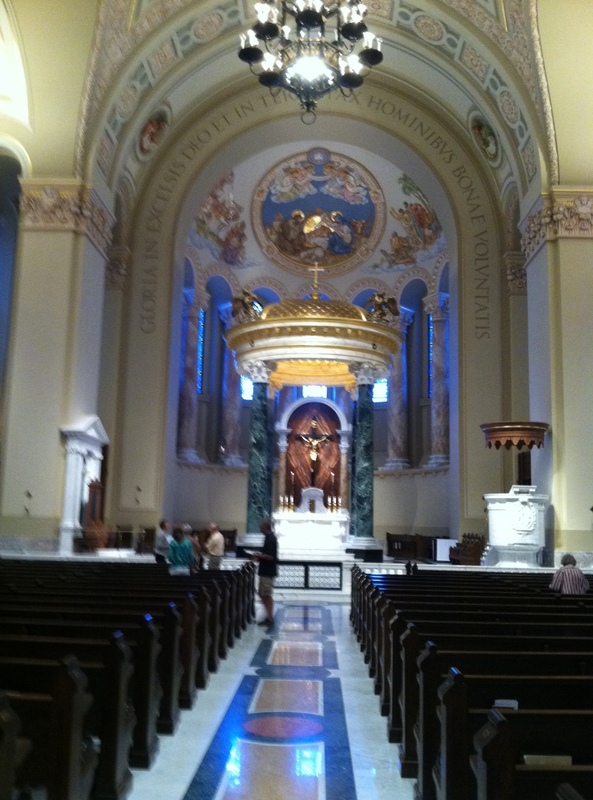 The one that came closest was the Cathedral of St. Joseph, the home church of the bishop of the diocese. I checked my GPS and I could be there ten minutes early. Sounded like a plan to me. I was glad I decided to stop because by the time I got there I was beginning to get sleepy. I entered the church and found two lines for confession, each about six or seven people long. Fortunately, there were two confessionals going at once and my line moved fairly quickly. These were old fashioned confessionals of carved, rich mahogany wood, with screens only so I couldn’t actually see the priest. I got lucky and had a very nice priest. I had nothing too serious to confess but I think the priest, after me telling him I am still new at this business, gave me three Hail Marys for either practice or just so I wouldn’t think I was wasting my time. 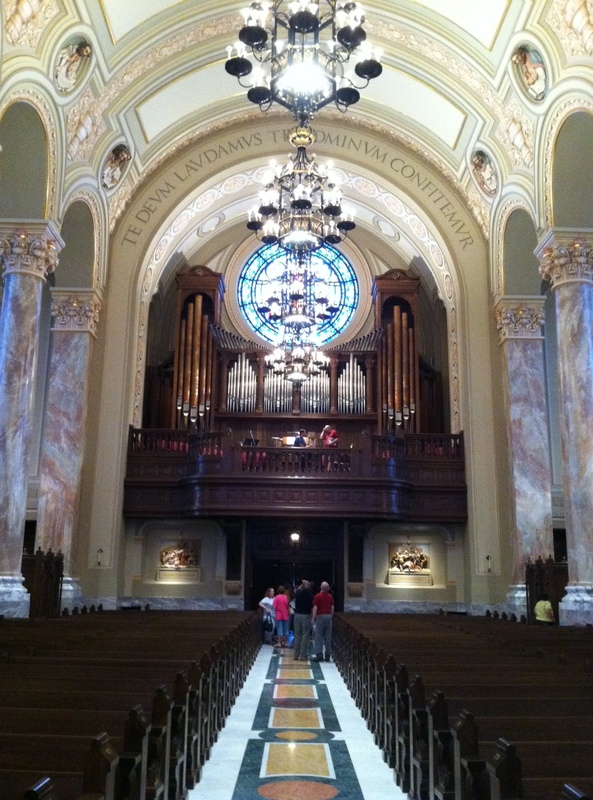 St. Joseph’s Cathedral is a beautiful church. I decided to stay for the Saturday afternoon mass since I didn’t know if I would be able to find a church on Sunday morning. The priest gave a very nice homily. The music was marvelous! The organist made the huge, old organ sing. After mass the thought occurred to me that it might be neat to post daily about the churches I am visiting on this cross-country trip. So, I took some pictures, inside and out. Back on the road heading west on I-90, I passed unknown millions of acres of more corn. My stop at church put me getting to my sister-in-law’s house south of Rapid City, South Dakota a little later than I expected. I was tooling along with the windows down, watching a thunderstorm roll in with a magnificent show of lightning, and otherwise enjoying the scenery with about 100 miles to go when the cruise control on my Subaru Outback decided to quit working. In addition to the cruise light on the dash blinking continuously, the red brake light also began blinking continuously, the check engine light came on and stayed on as did the traction control light. There was no change in power or performance so I assume it is simply a cruise control problem. Of course, it was Saturday night and I have a lot of miles to cover before any Subaru maintenance shops would be open on Monday morning. We’ll see where it takes me. I arrived at my destination about 9:30 local time with about 760 miles under my belt for the day, 1,400 for the trip. My sister and brother-in-law fed me a wonderful dinner of grilled chicken and asparagus and we caught up with each other’s lives. They just moved into a new house in the Black Hills south of town and this was my first visit to it. Upon waking this morning I looked out the huge windows of their family room across valleys of pine trees to see Mount Rushmore. It was a beautiful view! Tonight’s destination is a campground somewhere near Missoula, Montana. Preferably near a mountain stream where I can dream about flipping a dry fly into a riffle where an 18 inch Rainbow is waiting. Alas, with no time to fish, I can only dream about it on this trip. Prayers for a safe trip and a continual clean back seat. Perhaps there will be time for that rainbow on the return trip. It has been a great trip, Gary. See today’s post about spending time in thought and about my car! Hope you all are doing well. Yes, the cathedral s beautiful! We were there in July 2012 and plan to revisit soon. Antoinette, thank you for stopping by Reflections of a Lay Catholic.com. I hope you come back and visit again. 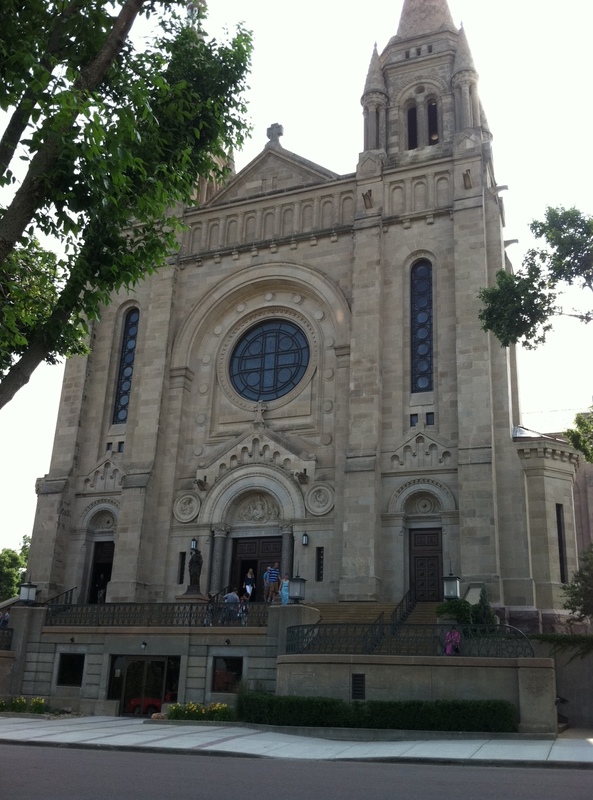 I will be making another trip from Cincinnati to Rapid City in about a week and I’m thinking about stopping by the cathedral in Sioux Falls again myself. It is definitely a beautiful place. Blessings to you.